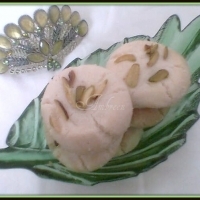 Barazeh, popular Middle Eastern cookie ,is a flat, crunchy sesame cookie with a touch of honey and pistachios.This is my variation of the recipe,see in Alterations for the original amount of ingredients. Scatter the sesame seeds on a baking sheet and toast in a 350-degree oven until a light golden brown. Combine the honey with the (1/2 tbsp.) 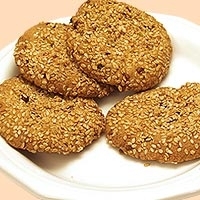 water and use to moisten the sesame seeds. Spread in a saucer. Stir together the flour, baking powder, and sugar. Cut in the butter, as if you were making pie crust dough. Gradually add the (1/3 cup) water until the dough is smooth. Form balls of dough the size of walnuts and dip one side of each ball into the sesame seed mixture to coat. The bottom side may be very lightly touched to the pistachios. Place on greased baking sheets, sesame side up. Bake at 350° F/180° C for 15-18 minutes, until golden brown. I am mad about sesame seeds! This looks so nummy! Thank you! 5!!!! We call it in Egypt Barazek and it is really great.Thanks for sharing.